SpaceX’s next and final generation of Falcon rockets is nearly ready to complete its biggest milestone yet, second only to operational launch. 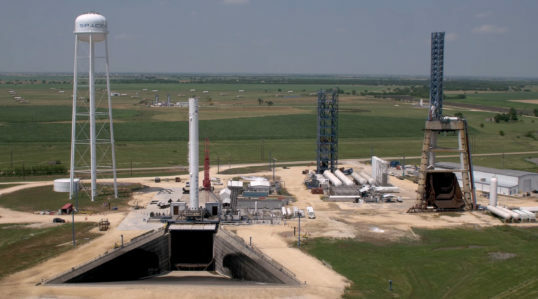 Known as Falcon 9 Block 5, the upgraded booster arrived at SpaceX’s McGregor, TX test facilities and went vertical on the static fire test stand. Now vertical, that first integrated static fire is likely to occur within a handful of days at most. 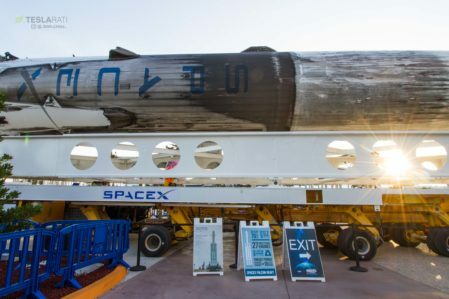 Once complete, assuming the data it produces do not betray any bugs or serious problems, the booster will be brought horizontal and transported to one of SpaceX’s three launch facilities for its first operational mission. 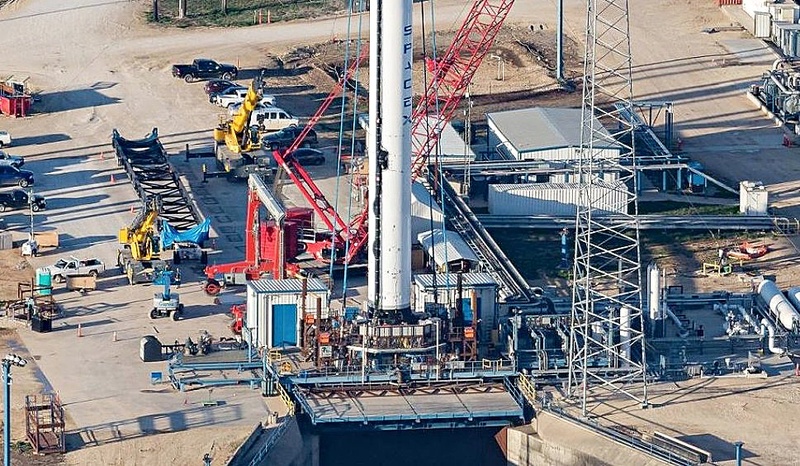 With nary a hint of hyperbole, it’s safe to say that Falcon 9 Block 5 will be the most significant piece of hardware ever developed and fielded by SpaceX. 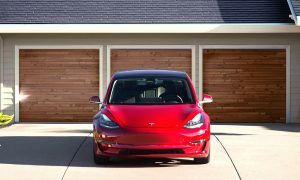 The reason lies in many of the changes and upgrades present in this newest iteration of the rocket. 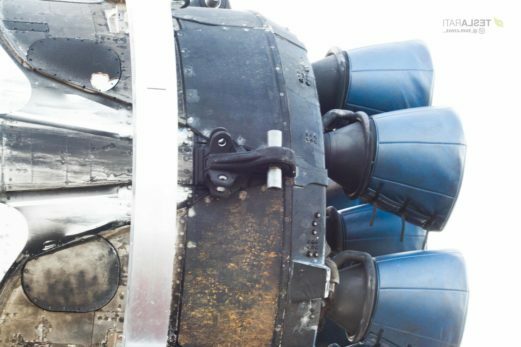 While Falcon 9 B5 and its similarly upgraded Merlin 1D engines include design changes intended to satisfy NASA requirements before SpaceX can be certified to launch humans, the brunt of the upgrades are laser-focused on ease and speed of reusability. Photo courtesy of Chris G at nasaspaceflight.com via Twitter. Reprinted with permission. 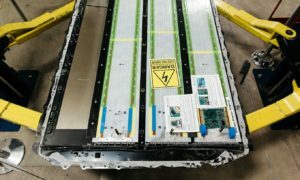 The goal with those upgrades, as publicly stated by numerous SpaceX executives, is to enable as many as 10 flights with a bare minimum of refurbishment and 100 or more launches with intermittent maintenance. To achieve those titanic aspirations, SpaceX has gathered a flood of data and experience earned through the recovery of nearly 20 Falcon 9 and Heavy boosters, as well as the successful reflight and second recovery of several of those same boosters. With that data in hand, the company’s launch vehicle engineers optimized and upgraded the rocket’s design to combat the worst of the extreme forces each booster is subjected to while returning to land (or sea). 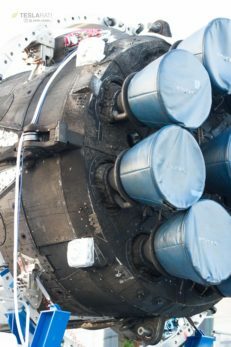 As evidenced by photos taken by Gary Blair, one of NASASpaceflight.com‘s most renowned L2 forum contributors, many of the visible differences between Block 5 and previous versions of Falcon 9 are a result of drastically improved and expanded heat shielding of its most sensitive and crucial components. 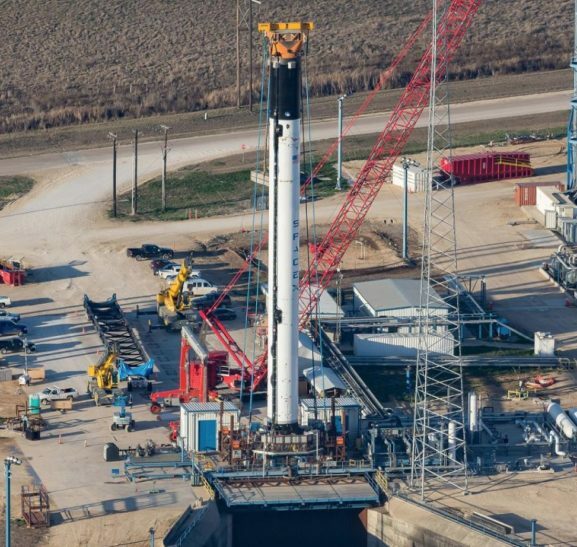 While Falcon 9 B5’s black sections by all appearances look like naked carbon fiber composite, they are likely to be coated with an incredibly heat-resistant material known a Pyron. 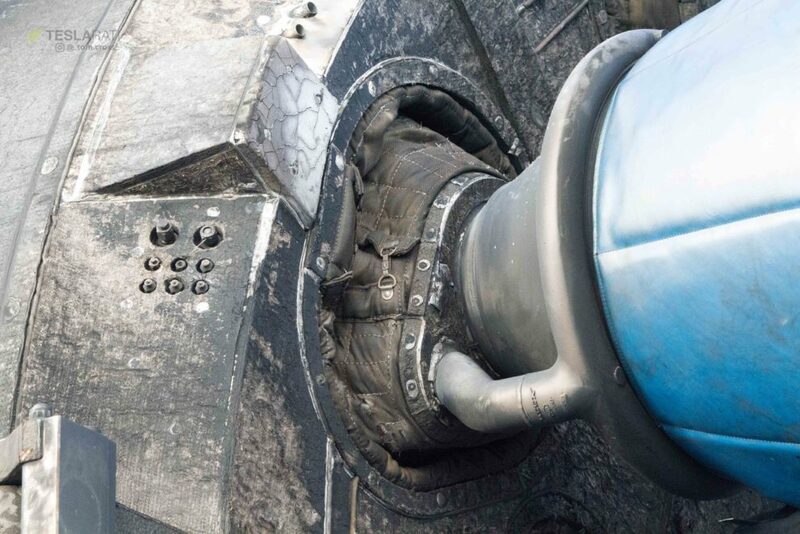 Portions of the booster that suffer from incidental scorching and extreme heating (aside from the octaweb) appear to have been treated with this material, including a pathway down the side of the rocket known as a raceway. The raceway is a protective enclosure for a variety of cabling and piping, essentially the rocket’s nervous system as well as the home of several the cold gas thrusters it uses to orient itself outside of Earth’s atmosphere. Titanium grid fins are another central feature of Block 5, acting as a near-indefinitely reusable replacement for the aluminum grid fins SpaceX has traditionally used. 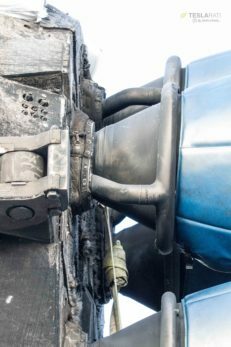 Put through a huge amount of heating during reentry; aluminum grid fins have famously appeared to partially melt during some of the hottest booster recovery attempts. Titanium, a metal with a much higher melting point, will have no such problems, does not need ablative white paint, and certainly appear all but untouched by reentry in the cases of both their June 2017 debut and second flight on Falcon Heavy’s side boosters. Finally and perhaps most importantly, is the octaweb – the assembly at the base of Falcon 9 responsible for safely transmitting nearly two million pounds of thrust from its nine Merlin 1Ds to the rest of the rocket’s structure, while also taking the brunt of the heat of reentry. Before Block 5, the octaweb was protected from that heating with an ablative thermal protection system, likely around 80% cork and 20% PICA-X, the same material used on Cargo Dragon’s heat shield. 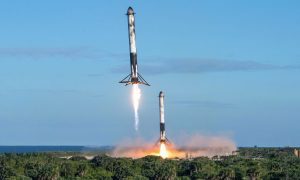 Based on comments made privately by individuals familiar with SpaceX, that ablative shielding is to be replaced by a highly heat-resistant metal alloy known as inconel. By ridding Block 5 of ablative heat shielding, SpaceX will no longer have to carefully examine and replace those materials after each launch, removing one of the biggest refurbishment time-sinks. Combined, these various upgrades are intended to enable Falcon 9’s first stage to be reused almost effortlessly compared to previous iterations. 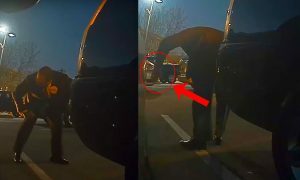 With this vehicle, including the reusable fairing debuted on the launch of PAZ, SpaceX may well be able to achieve Elon Musk’s famous goal of lowering the cost of launch by nearly an order of magnitude. 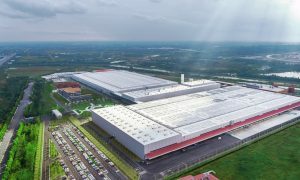 While SpaceX will likely use that cost reduction to first recoup its considerable investments in reusability and Falcon Heavy, major price drops may reach customers soon after. 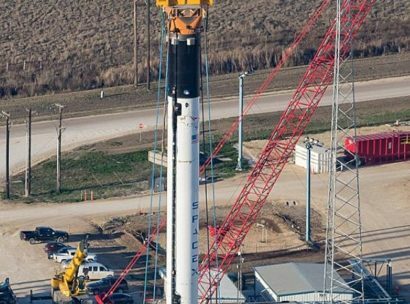 This Falcon 9, in particular, is unlikely to launch for another month or so, but when it does, it is perhaps the biggest step SpaceX has yet taken on the path to routine, rapid, and affordable access to orbit.